Wyoming survived another conference road test last week at Nevada to run their record to 5-2 (3-0). This week they will take on conference power Boise State 7-0 (3-0). The Cowboy’s win was not pretty, but a road win in the Mountain West is always something to be happy about and the Cowboys ended Nevada’s 6 game winning streak at home. Last Week Boise State survived a battle against BYU at home. This week the number one spot at the top of the Mountain West’s Mountain Division is on the line. 1. Brian Hill was a man amongst boys last week. Hill almost single handily won last week’s football game for the Cowboys. From the very beginning he was nearly unstoppable. By the end of the night Hill had over 300 yards of total yards, 3 touchdowns, and most importantly a win. Hill’s big game put him at number 2 in the country in yards rushing and yards rushing per game. Hill is a special talent, no question and the Cowboys may need another memorable performance again this week in order to pull off the upset against Boise State. 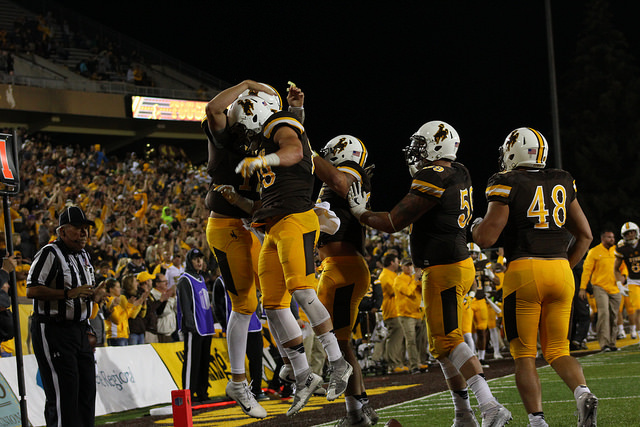 In the games prior to the Nevada game the Wyoming defense had two things working. The first was consistent pressure on the quarterback, which led to the second thing they had working for them, turnovers. Last week, the Cowboy defense played their first full game without defensive end Carl Granderson and they struggled to get consistent pressure on Nevada’s quarterback. When the game was over the Wyoming defense had surrendered more than 347 yards in the air and only caused 1 turnover and 2 sacks. Without Granderson and NT Chase Appleby the line struggled to get on the QB. Consistent pressure on Boise State quarterback, Brett Rypien is a must. Allen was solid last week, he finished the game 8/12 for 135 yards, ran for 2 scores and caught another. Allen was as good as he needed to be. He came through when called upon, but the running game and Brian Hill were so strong he wasn’t called upon often. This week will be different. Allen needs to be ready to hit on big plays when they are there and continue to convert on third and medium to long with either his arm or legs. If Wyoming is going to pull off the upset, the offense needs to convert on third down, stay on the field at periods of times, avoid turnovers and turn those drives into points. Allen will undoubtedly be a major factor in all of that. 4. The secondary needs to be better. The secondary got exposed last weekend. 347 yards allowed and 19 first downs through the air. Brett Rypien is in my opinion the best quarterback in the conference and if the secondary plays like they did last week it will be a long night for the Pokes. I understand that part of the reason Nevada was so successful through the air was because there was little to no pass rush, but even when there was pressure Nevada seemed to have a guy open. The secondary needs to be better, especially on 2nd and 3rd down passing situations. 5. If the Cowboy’s can get some early momentum, an upset is possible. Wyoming is riding a 3 game winning streak and has won 4 straight at War Memorial Stadium, Boise State is undefeated and ranked in the top 15, and both teams are undefeated in Mountain West play. Calling this game “big” is an understatement. This is a huge game for both teams. Wyoming is a potential roadblock standing in the way of an undefeated season for Boise State. Boise State is a perfect opponent for the young Cowboys to try to prove to everyone that they belong in the discussion of MWC title contenders. Wyoming is a heavy home underdog, rightfully so. Boise State has had their number since they joined the conference. If the Cowboys can come out and score some early points, force a couple punts and/or turnovers and seize the early momentum an upset is very possible. Make no mistake about it; the home crowd can be the difference. The Pokes fed off of the crowd in their homecoming win against Air Force and they need your help again this week. I am calling out the Cowboy faithful, go support this program. You might just witness something very special by the end of evening.